A wagon ride onto the prairie, a tour of the sod homestead and the chance to feed farm animals are all possible summer activities at Plains Conservation Center (PCC) in Aurora. Denver Botanic Gardens partners with the City of Aurora to provide education and public programs at this property that is part of the City of Aurora, Parks, Recreation and Open Space Department. 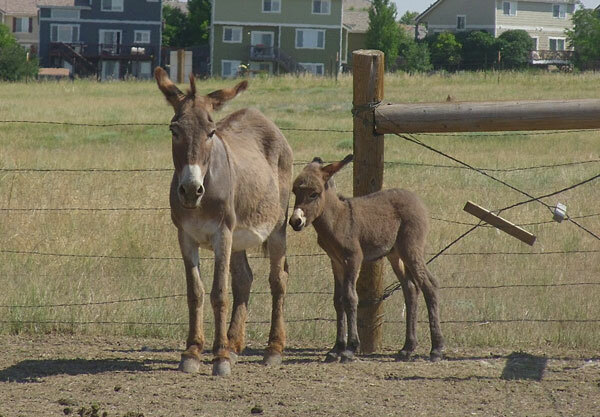 And now there is a new star of the show, a baby donkey that was born in late June! She is not yet named, as the City of Aurora plans to conduct a naming contest, but that doesn’t make her any less cute. We all can’t get enough of her! You can get up close to her (donkeys were used to protect the sheep—sheep were used for food by the homesteaders) and many other farm animals during a daily animal interaction program called "The Art and Science of Raising What You Eat," conducted by City of Aurora naturalists. This program is 11:30 a.m. – 12:30 p.m. on weekdays and 3-4 p.m. on weekends through mid-August. Another activity to make your trip to PCC special on a Saturday is to participate in two different tours. The first, "Plains Conservation Center Prairie Wagon Tour," is a wagon ride onto the prairie to learn about the short grass prairie and the plants and animals that call it home. You might see red-tailed hawks, pronghorn sheep or prairie dogs, among other sights. This tour is 10-11:30 a.m. on select Saturdays through July. The second, "Plains Conservation Center Cultural History Tour,” is a tour of the sod homestead and the Cheyenne Camp at PCC where you will learn how different groups of people adapted to living in the plains ecosystem in the 1800s. Your guide will take you into the different buildings that make up the sod homestead village, including the homes, schoolhouse and blacksmith shop. You will also visit the tipis that make up the Cheyenne Camp and learn about some of the typical objects used that were sourced from the prairie ecosystem, such as many objects made from the bison who were ubiquitous at the time. This tour is 12:30-2 p.m. on select Saturdays through July. Starting in August, these two tours will be combined into one tour, "Plains Conservation Center Wagon Tour," running 10:30 a.m. – 12:30 p.m. on Saturdays in August. Why, you ask? Because of a pair of eagles nesting in a very inconvenient tree, the shorter prairie route was not available as nesting eagles are protected by a perimeter between November and July. Once the perimeter is taken down we will have more flexible tour options. Unfortunately, we do not believe our resident eagles hatched any eaglets this year, but we certainly hope they keep trying! Register for many more programs and tours at PCC. Come on out to Plains Conservation Center and see us soon! PCC is located at 21901 E. Hampden Avenue, Aurora, CO 80013.